Wrap dough and refrigerator 15-20 minutes. Roll dough out on a floured surface to about 1/8 inch thick. Using fluted cutters, cut one large wreath and use a smaller cutter to make a center cut. Put on parchment lined or silpat lined sheets. In a small bowl, mix 1-3/4 cups confectioners sugar and 2 tbsps milk (can also use lemon juice) to make a smooth frosting. Top each cookie with frosting and sprinkle on pistachios and perhaps a small piece of a candied cherry for color. 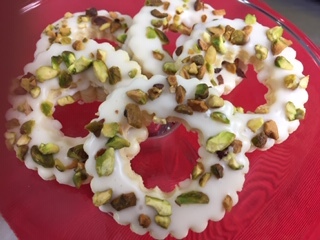 This entry was posted in Recipes, Videos and tagged Cookie, Pistachio. Bookmark the permalink.